Last year's fight between iPhone 5S and Samung Galaxy S5 has not yet faded, the battle between Apple's new iPhone 6 (Plus) vs Samsung Galaxy Note 4 keeps simmering for months. In response to the strong iPhone 6/6 Plus sales of a record 10 million in the first weekend, Samsung moves up Galaxy Note 4 launch on Sep 29 that's the same day Apple starts the second wave of iPhone sales, indicating an inevitable fight between the two mobile phone giants Samsung and Apple. While the 4.7-inch phone and the larger 5.5-inch phablet already create a cliffhanger among Apple lovers, apart from iPhone 6 (Plus)'s awesome specs, Samsung Galaxy Note 4, released on Sep 3, proves to be as an uncompromising gadget, touting never-disappointing features as well. If you are thinking about digging more about the release, specs, features and prices of iPhone 6 (plus) and Samsung Galaxy Note 4 but don't want to be off the track by some uncertain Galaxy Note 4 vs iPhone 6 Plus reviews, keep read on. This following iPhone 6/Plus vs Samsung Galaxy Note 4 comparison will showcase everything about these two gadgets for you to make up your mind whether to go for the venerable iPhone 6/6 Plus or pick up Galaxy Note 4. Before we compare iPhone 6 Plus vs Samsung Galaxy Note 4, we've reviewed and searched the most-asked questions about the two smartphones by Apple and Samsung. 1. Screen: How big a screen do I need? Does the display size matter when it comes to watching Hollywood movies? 2. Operating system: Should I buy an Apple iOS-based phone or switch to Android platform? 3. Processor: Is it dual or quad core? Is it strong enough to power the phone? 4. Battery: Which smartphone has the longest battery life for browsing, reading, writing, messaging, or watching movies? 5. Price: How much do I want to spend? Is it worth my buying? Below are the detailed iPhone 6 vs Samsung Galaxy Note 4 specs you must know before we review these two 2015 top mobile phones. Actually, to know the iPhone 6 (Plus) and Galaxy Note 4's specs is just the beginning. If you want a better insight on the two devices you should go for, you'd better have a clear clue about the features of the next gens of iPhone 5S and Galaxy Note 3. Here are the detailed specs, features and prices review for you to better know whether iPhone 6 Plus is better than Samsung Galaxy Note 4. Apple dropped the iPhone 6/6 Plus in stores last September 19 and posted a record-breaking sales of 10-million iPhone 6 and iPhone 6 Plus in the first weekend. While Samsung brought forward the release date of Samsung Galaxy Note 4 to Sep 26 to challenge Apple's iPhone 6/Plus. Whatever, the Galaxy Note 4 release date, as it is the same day as the second wave of iPhone 6 (Plus) sales, will witness a close quarters between iPhone 6 Plus and Samsung Galaxy Note 4. For the iPhone 6's screen size, specifically two sizes, both are bigger than the previous iPhone, having a 4.7 inch display with a 1344*750 resolution and a 5.5-inch display with a 1920*1080 resolution. But new Note 4 retains the same 5.7-inch display size as its predecessor Not 3 but ship with an ultra-ship 2560*1440 quad HD display that brings the gadget up to speed with the recent LG G3 in terms of screen resolution and make images on the Galaxy Note 4 sharper and colors truer. Such resolution is not something we will see Apple iPhone match. Anyway, whether iPhone 6 Plus or Galaxy Note 4 will win in this run, we'll for sure experience a stunning visual feast on both gadgets. Apple iPhone 6 Plus has an anodized aluminum material on the back without a visible seam. It keeps up with the ''the thinner the better’’ trend, measuring just 7.1 mm. While the Note 4 follows similar design language that Samsung likes, which is made of plastic with a little bit of metal and measures 8.5 mm. 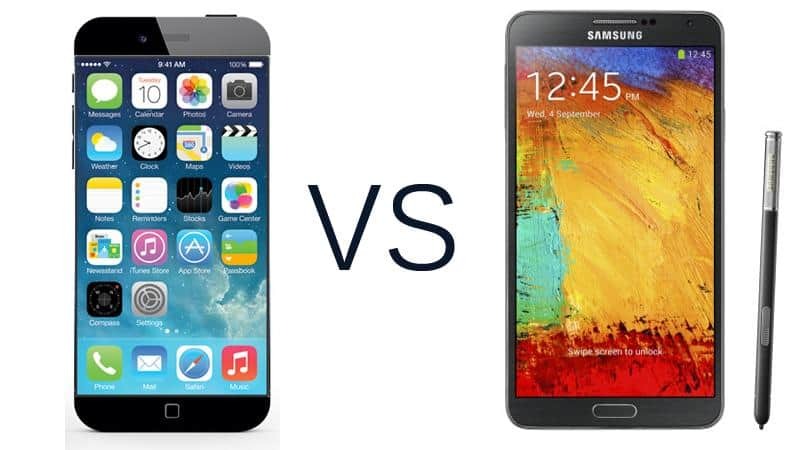 In this round, iPhone 6 (Plus) excels Galaxy Note 4. While as far as the bend test concerns, compared with Samsung Galaxy Note 4, iPhone 6 and iPhone 6 Plus seem to be a little bit disappointing. Report says the thinner iPhone 6 (Plus) may bend in your pocket as a result of the aluminum as its metal to house the new phone since it is soft and bendable metal. Similar to Apple iPhone 6 problem, a Sony Xperia smartphone bends as well. Unbox Therapy tested the Samsung Galaxy Note 3 after the iPhone 6 bend test and found that it holds up better than the iPhone 6 Plus. So will Samsung Galaxy Note 4 perform better than iPhone 6 Plus? If other tests have similar findings to Note 3, Samsung will soon joke at the iPhone 6 in Galaxy Note 4 launch. The iPhone 6 Plus features Apple's upgraded 64-bit A8 chip with a dual-core processor running at 2GHz or more, which helps to improve the efficiency of the battery on iPhone 6 Plus. That's to say, we can anticipate a 46% battery bump from the existing iPhone 5 battery, 2100mAh of battery capacity. The Samsung Galaxy Note 4 includes a faster Snapdragon 805 chip. Speaking of battery life, the Samsung Galaxy Note 4 battery comes at a capacity of 3,300mAh, which is to handle the higher-resolution 2560*1440 display. When it comes to OS, Both of Apple iPhone 6 Plus and Galaxy Note 4 run an upgraded operating system. The former runs iOS 8 that was first introduced at the WWDC 2014 in June. This OS update has brought many new features, including interactive notifications, iMessage, and continuity for you to sync your iPhones with Apple's new desktop OS, Mac OS X Yosemite. While regarding to Note 4' OS, it runs the Android 4.4.4 KitKat that includes a host of new features like "Swipe to launch Motion Launcher", "Aqua Capture", "Multi Network for Booster", and "Smart Fingerprint". The bad news is that iPhone 6 and iPhone 6 Plus users recently seems to be tangled with the iOS bugs including the HealthKit fitness problem, cellular voice, data service and issues with Touch ID. And Apple is pulling iOS 8.0.1 update to fix these bugs. The fourth generation of Galaxy Note sports an either a 16-megapixel main camera. Apple has not increased the resolution of the iPhone's rear camera sensor, sticking to 8MP. But please keep in mind that megapixels don't really decide the quality of images and Apple's image sensor and processing engine ensures better photos compared to phones that come with high-resolution sensors. Although Galaxy Note 4 comes with 4K video recording while the iPhone 6 Plus camera is limited to full-HD, 4K hardware still not being mainstream, we don't think it will matter. And we expect the camera of iPhone 6 Plus to be better than Note 4. By now, you may have a rough idea of iPhone 6 Plus and Galaxy Note 4. The Samsung Galaxy Note 4 is better when it comes to the big screen. But the iPhone 6 Plus is superior to the 4th generation of Note as it is smaller and subtle, easier to operate. Whatever, the final deciding factor for making the right choice is definitely your list of requirements and preferences. By the way, whenever you get the new iPhone 6 Plus or Galaxy Note 4, you will without doubt want to make utmost of the gadget, like watching DVD movies or videos on the high resolution screens without worrying about the format incompatibility issues, driving you to find some must-have apps for iPhone 6 Plus, iPhone 6S/Plus & Samsung Galaxy Note 4. 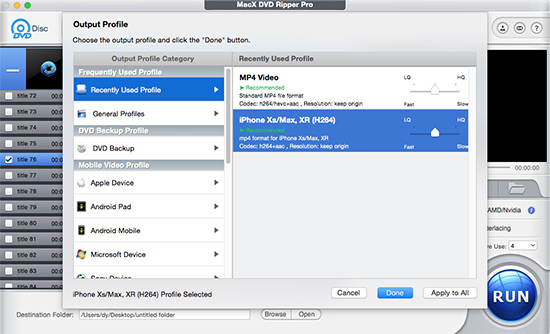 Here MacX DVD Ripper Pro is all what you want for DVD playback on the two new devices. By adding profiles for Samsung Galaxy Note 4 & iPhone 6 (Plus), iPhone 6S/Plus, any DVD can be ripped and converted for playback on the latest Apple and Samsung devices. 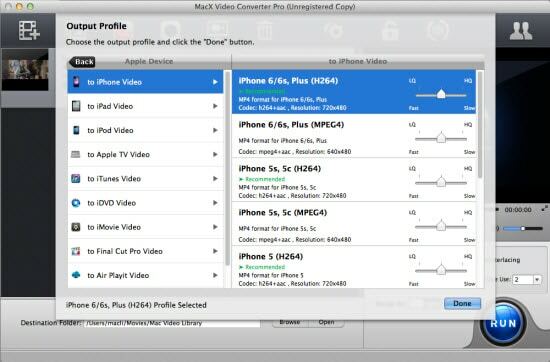 For people who are looking forward to enjoy high quality videos on the brand new gadgets, MacX Video Converter Pro is a must-have iPhone 6 Plus, iPhone 6S/Plus & Samsung Galaxy Note 4 app, capable of converting HD MKV, AVCHD, MTS, WMV, AVI, FLV and other videos to iPhone 6S/Plus/6/6 Plus/5S/5C/5, Samsung Galaxy Note 5/Edge, Galaxy S6 edge+/5/4/3, HTC One, etc with a couple of clicks. Sometimes, you cannot play MKV, AVI or other file formats on iPhone 6 or other models. In this case, you'd better to know the best video format for iPhone (.m4v, .mov, .mp4). Check the guide. You will get an error message unsupported format when import MKV video to iPhone 6. This guide will allow you to convert MKV to iPhone 6 before you play it. MacX Video Converter Pro provides the best solution to convert various videos to portable devices. It is a feature-rich, high quality, and incredibly fast video converter.